The Dogs, cats and other pets advertised for adoption here and elsewhere on this site may have been advertised by private individuals or Pet Rescue or Pet Welfare organisations. In each case, the current owners-keepers will have their own procedure for adoption. Please remember that in the majority of cases, adoption enquiries are not handled by telephone, and may require a certain amount of form filling and a house visit. If you are interested in adopting a dog, cat or other small pet, you will generally need to make an appointment to view the animal. 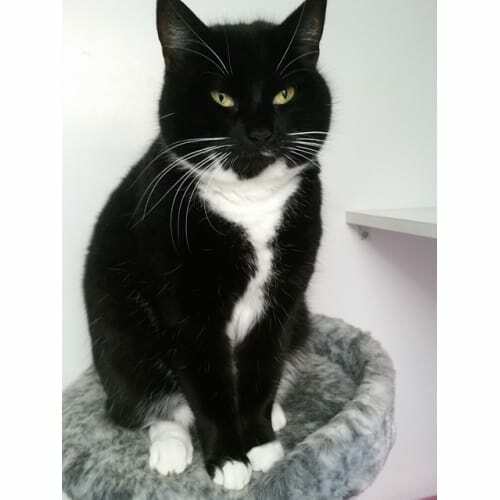 This lovely black and white cat is Purdy, a 5 years old female looking for a new home after her owner was unable to cope following a change in personal circumstances. She was already neutered so after a health check at the vets, along with vaccination and microchip, she is ready for a new start. It didn’t take Purdy long to settle in with us. She is quick to stretch out of her bed for fusses when we arrive at the cattery. She loves a good head stroke and chin rub but doesn’t like to be overly smothered with love. She’s a smart looking lady with lovely white socks and bib. Her big round face is just irresistible and her big green eyes make her very striking. Purdy is also a dribbler, which we love, but it does mean you need a tissue with you when giving her lap cuddles! 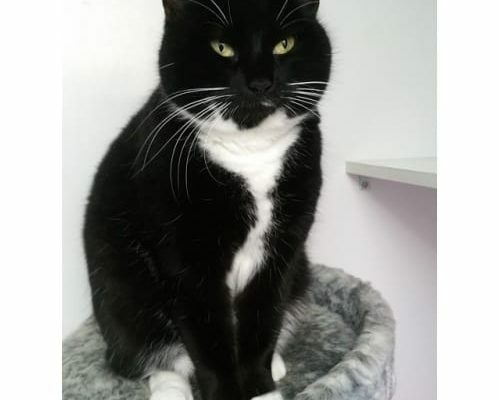 Although Purdy was taken into care along with another cat, she showed no interest in remaining with him, and while she may be willing to share a new home with another friendly cat, she would probably be just as happy being centre of attention and having the house to herself. 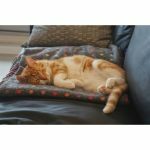 She would enjoy a safe outdoor area to explore once she’s settled into her new home and would be best suited to a home with children of secondary school age or above. If you are interested in giving a new home to Purdy, please get in touch with the owners-keepers today. Pets can be listed for adoption by private individuals, animal charities or voluntary groups, and each will have different contact preferences and adoption procedures. Depending on their preferences, the current keepers may prefer telephone or email enquiries in the first instance, or may provide an address where you can visit and see their pets and discuss adoption in person. If a telephone number or address was provided, click the 'telephone' tab and you will find it there, along with any comments on when to phone, etc. If the keepers are willing to accept email enquiries, there will be a contact form on the 'Email Enquiries' tab which you can use to get in touch. Viewing address: Not given at this stage - please contact by telephone or email in the first instance. Note that due to limited manpower, animal rescue charities and voluntary groups may not always be able to respond to telephone calls, so please be patient. When calling private individuals, please consider the time when ringing! In any case, do not call the number shown unless you want to enquire about adopting the pet listed here. Use this form to enquire about adopting the pet featured on this page, and not for any other purpose. To allow the advertiser to reply in whatever way is most convenient, you must provide both a contact telephone number and email address.